Far away in a foreign land known as the Kingdom of Thailand in southeast Asia, reclined on the bed in my humble abode as a study abroad student, I'm watching a commencement ceremony on YouTube. It was the 2013 graduation ceremony at Webster University Thailand, my alma mater. The honored speaker recalled her Peace Corps Thailand experience and how it shaped the path her professional life would take. Peace Corps, Peace Corps, Peace Corps. The name kept circulating within my brain as I visited the website to see what the organization entailed. Was it love at first sight? You bet it was. Immediately I was bedazzled by the awesome humanitarian work characteristic of this unique federal agency. Moving forward I registered for a webinar to determine whether I should apply for a Volunteer position. The webinar helped solidify my decision to start the process of joining the Peace Corps. Joining the Peace Corps as a first-generation Volunteer within my family would enable me to blaze a new trail of servant leadership in a global capacity. I would have the privilege of taking on some of the world’s most pressing issues by offering my piece of America – knowledge, skill set, cultural background – to the people of my host country (wherever that would be). Indeed, it would be an honor to stand on the shoulders of the nearly 220,000 Americans who have answered the call to national and international service, all while doing my part to leave a sustainable footprint behind for those who succeed me. Joining the Peace Corps as a first-generation Volunteer would enable me to blaze a new trail of servant leadership in a global capacity. Interview day came. I met the pleasant and encouraging recruiter, face to face, who provided me great insight into her own Peace Corps adventure. The longest job interview I’ve ever encountered ended on a positive note; I left it with a confident expectation of a favorable outcome. Some months later the recruiter asked me to select one country [from the list of countries that had education projects feasible for my qualifications] wherein I’d want to serve. Not really knowing exactly where I wanted to go, I went out on a limb and chose Macedonia based on the research I had done and service departure date. Several months later, on December 31, 2014, I received possibly the best news of my life: The Peace Corps officially extended an invitation for me to serve in Macedonia as a TEFL (teaching English as a foreign language) Volunteer. 2014 could not have ended on a brighter note and I literally wanted to leap through the ceiling as a result of my overflowing joy. Crossing the threshold of 2015 was the best feeling in the world because I obtained the direction for which I sought. Gratefully accepting the invitation to serve, I had excitedly matriculated into Peace Corps University. The long and rigorous process was making strides, and from January up to now I’ve relentlessly immersed myself in all things Peace Corps. Such immersion has included everything from following the Peace Corps Macedonia Instagram page to connecting with returned Peace Corps Volunteers on LinkedIn to combing through tons of digital training literature as required of all prospective trainees. Of course I’ve befriended the Peace Corps blog, inspired by the admirable feats of past, present and future Volunteers. Reading and pondering their stories has only sharpened my zeal to put my hands to the plow of service. Having taken a hiatus from teaching English overseas full-time in order to earn a graduate degree, I am quite exuberant about getting back into the classroom. Education is an authentic and fierce lifelong passion of mine, one that I am blessed every day to be able to share with others (through writing, tutoring and general conversation), especially with the next generation of world changers. With my departure date for service quickly approaching, I earnestly desire to maximize this special opportunity for all it’s worth. 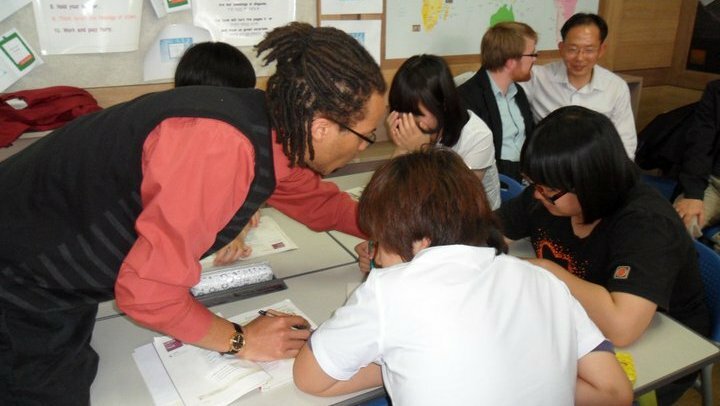 Charles McKinney heads to Macedonia in September to teach English to secondary education students. He already has multiple ideas in mind for secondary projects that he would like to test out at his permanent site.